The women were not as extensively tattooed as the men. Their upper lips were outlined, usually in dark blue. The nostrils were also very finely incised. The chin moko was always the most popular, and continued to be practised even into the 1970s. I think if we’re going with this, we should probably limit the types of tattoo by bloodline and gender as well, since Sebiestor are something different, and women aren’t likely to have more than the mouth region with moko. So… yeah. I guess calling it a beard or stubble is kind of insulting, given what its supposed to represent. Sorry about that! The next thing to apologise for is confusion surrounding the Ray of Matar tattoo. I got a spike of traffic yesterday because of my post, but for the wrong reasons. Its never my intention to confuse anyone, or to spout ignorant garbage, but considering all the faux pas I made, I really dropped the ball on this one. 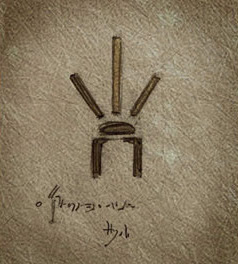 This is a tattoo displayed within the text for the Ray of Matar story. It is unmarked apart from some (to me anyway) illegible script within the image itself. Its probably this that gave me the idea, but when you re-read the text you’re presented with “extending down and side-ways from her left eye were several dark lines, ranging from one to three centimeters in length.” which is entirely different to the pattern above. But there was more to it than this image. I (mistakenly?) merged the above image with the representation of Karin Midular from in-game, who at the time had a tattoo vaguely similar to the one above. I can no longer find an image of her larger than about 128x128px so its really hard to see, or indeed to prove my crazy ramblings.